The MTA WA and AIT celebrated the achievements of our graduating apprentices on Thursday evening, December 13th, at our Apprentice Graduation Ceremony. 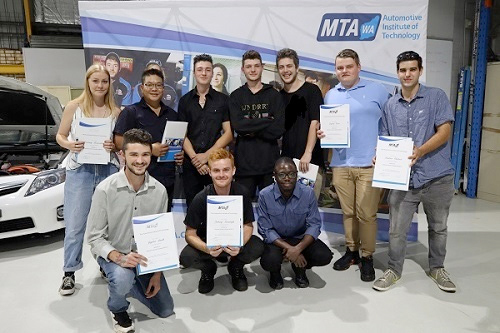 Held at the AIT Balcatta Training Centre, students who had recently completed their apprenticeships came together in a ceremony of recognition, where their hard work and dedication throughout their time at the AIT was acknowledged by their family, friends, peers and AIT staff. Students were awarded their official certification, one which affords them opportunities that are unprecedented in respect to current and future job prospects. Students, teachers, family and friends all attended the evening and shared a celebratory drink with a generous serving of George’s Kebabs. More than a food truck, George’s provided a flavour sensation that was almost as memorable as the ceremony! We would like to congratulate all our students finishing their apprenticeships, and we wish you all the best in your future automotive endeavours!